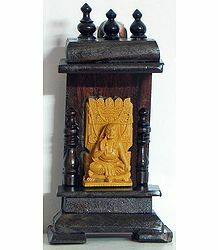 Oft times, Hindus adore and worship not only Devis, Devatas and Upadevatas, but also their vahanas (vehicles or mounts); the flowers, animals and birds they have by their side at all times; the musical instruments held by them; and even the grahas and nakshatras (planets and stars) associated with them. Such is the case of the Sheshanaga, also known simply as the Shesha or Adishesha. This large snake is the Nagaraja or the King of the Naga (snake) race and one of the primal beings of creation itself. Adishesha holds an important position in Hindu mythology, philosophy, art, culture and literature. In Buddhism, he is considered to be Vasuki. In the Puranas, Shesha or Sheshanaga is believed to hold all the planets of the Universe on his vast hoods. An ardent devotee of Lord Vishnu, he constantly sings the glories of his Lord from all his mouths. He is sometimes referred to as Ananta Shesha, which means the Endless or the Infinite One. It is said that when Adishesha uncoils, time begins to move forward and creation starts to take place. When he comes back to his coiled position, time stands still and the Universe ceases to exist. Adishesha is depicted as a massive coiled snake and one that floats in space, or on the Ocean of Milk. On the Ocean, he forms a bed on which Lord Vishnu reclines, with Goddess Lakshmi, the God of Wealth, at his feet. Shesha is sometimes portrayed either as a five-headed or seven-headed serpent. More commonly, though, he is depicted as a thousand-headed serpent, with each of the heads (or hoods) wearing an ornate crown. His name comes from the Sanskrit root "sis", which means, "the One which Remains". This is due to the fact that Shesha always remains in spite of all the Pralayas (Great Floods), each of which kalpas (aeons) and yugas (eras) in the past. Interestingly, in Sanskrit texts; especially in those relating to mathematical calculation; the term "Shesha" implies the "remainder" - that which remains, while all else ceases to exist. In the Bhagavad Gita, Lord Sri Krishna declares, "Anantaascha Asmi Naagaanam". This means, "Of the Nagas, I am Ananta (or Shesha)". This is proof enough of Ananta's importance in the Hindu pantheon. 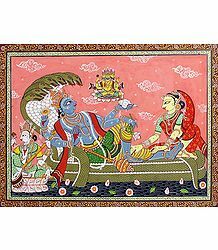 Vishnu is often shown reclining on Shesha. The latter is considered to be his loyal servant and a manifestation of Vishnu himself. According to Hindu mythology, he had descended to Earth in two human forms, namely, Lakshmana (Lord Rama's brother) and Balarama (Lord Krishna's brother). According to the Mahabharata, Shesha was born to Rishi Kashyapa and his wife Kadru, one of the daughters of Daksha. In due course of time, Kadru gave birth to a thousand snakes, of which Shesha was the eldest. After him, Vasuki, Airavata and Takshaka were born in that order. Many of Shesha's brothers were cruel by nature and took great pleasure in inflicting harm upon others. 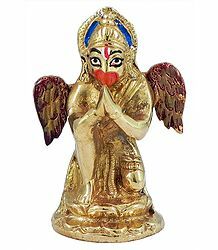 Kashyapa also sired Garuda through Vinatha, Kadru's sister. Shesha's brothers were unkind to him as well. Disgusted with the bad behavior of his brothers, Shesha left his family and decided to undertake severe austerities and penance. He lived merely on air and meditated in a number of places, including Gandhamadana, Badrikashrama, Pushkara, Gokarna and the Himalayas. Pleased with his dedication and devotion, Brahma appeared before Shesha and told him to ask for a boon. The former requested that he should be able to keep his mind under control, so that he could continue with his ascetic practices. Brahma gladly bestowed the boon upon him. Brahma then asked a favor of Shesha - to go beneath Earth and stabilize it. The latter was only too happy to be given the new responsibility. He immediately went to Patala (the Netherworld), raised his hood and balanced the Earth over it. It is believed that he supports the Earth even today. The serpent is often viewed as one of the most feared creatures in the world. It usually stands for the evil and demonic aspect of the world. Lord Shiva wears Vasuki and other serpents around his neck, wrists and ankles. This is symbolic of Lord Pashupatinath assuring his devotees that no evil can come anywhere near them, once they surrender to him and seek his protection. Snakes are also, in a way, a representation of mystery and mysticism, and deep and dark passions and feelings of human beings. By wearing them around his neck, Shiva states that he has reached the heights of siddhi, by overcoming all forms of desire. Hence, he is in total control of the forces of Prakriti, maya and samsara. 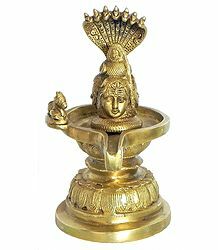 As mentioned earlier, Shesha is most often portrayed as floating in the Ocean of Milk, forming the bed and the protective roofing canopy on which lies Sri Maha Vishnu. This form of Vishu is referred to as Anantashayana, that is, the one who reclines on Ananta or the Sheshanaga. Interestingly, the city of Thiruvananthapuram in the Southern State of Kerala is named after Lord Ananta, the Infinite One. In the Bhagavata Purana, Shesha is named Sankarshana, the tamasic energy of Vishnu himself. He is believed to live deep within the inner reaches of Patala, where one can find several hundreds of serpents, each having a gem on its head. Sankarshana, who is considered to have been alive even before the creation of the Universe, is the ruler of this place. Toward the end of each epoch, he creates 11 Rudras from himself, in order to destroy the current Universe and create a new one. According to the Bhagavata Purana, Sankarshana is the foremost manifestation of Lord Vishnu himself. Also called Ananta, he has no beginning or end and is the kaaranakarta (the prime reason) of the material world as we know it. 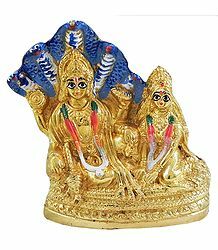 Before Vishnu manifested as Krishna, the original Sankarshana took the form of Balarama, just to please the Supreme Brahman with his many leelas. At the very beginning of the Universe, Sankarshana expanded himself as Garbhodakshayi-vishnu, in order to create Brahma. In other words, Sankarshana is an aspect of Lord Sri Maha Vishnu himself. According to some chapters the Purana, Lord Sankarshana narrated the Bhagavata to the Four Kumaras, who in turn reached it to everyone. Sankarshana constantly waits upon Vishnu and is always ready to serve the Supreme Godhead. He is the first expansion of Vasudeva. Due to the fact that he appears by his own will, he is called Svarat - the One who is completely Independent. He is also totally transcendental and the limits of time and space do not apply to him. Sankarshana is also one of the four vyuha (army formation of troops while in battle) forms of Vishnu or Krishna. The other three vyuhas include Vasudeva, Pradyumna and Aniruddha. The serpent, in Indian philosophy, is often associated with the Kundalini energy, which usually lies dormant within the seven chakras of the sukshma sharira (subtle body) of every person. 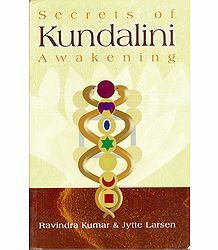 The Kundalini is often represented as a figure of a coiled serpent Goddess, which is believed to be residing in a slumbering state in the first of seven Chakras; near the base of the spine. Different schools of spiritual thought teach different methods of awakening this kundalini shakti, for the purpose of reaching spiritual enlightenment; thereby helping the seeker attain several siddhis. Once this serpent is roused, she lifts her head and slowly rises up through the chakra channel of the spine, till she reaches the Sahasrara Chakra, which is situated at the crown of the head. Interestingly, the Sanskrit word "kundalin" means "circular" or "coiled", forming a sort of ringlet. Sri Maha Vishnu symbolizes the Supreme Brahman in its entirety - the One who rests on the Kundalini Shakti, in the form of Adishesha. This represents the kundalini of the whole Universe. As per the Bhagavad Gita, the entire creation stemmed from the Swabhava (nature) of the Atman (Supreme Self). Vishnu rests on that shakti and harnesses it to manifest the creation that he imagines. Goddess Earth being balanced on Adishesha's hoods represents the Earth's own Kundalini shakti, which is stabilized by the forces of nature. Adishesha, Sri Maha Vishnu's prime devotee, saw to it that he accompanied his Lord even during his Avataras. When the latter came down to the Earth as Rama; Shesha accompanied him as his ever-devoted, ever-loving younger brother, Lakshmana. Lakshmana's devotion and dedication to Rama was exemplary. He selflessly served his brother, never once thinking of his own comfort. When Rama went on exile, Lakshmana left his wife behind and accompanied his brother to the forest. 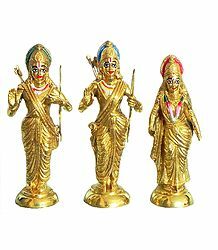 There, his main mission was to serve and protect Rama and Sita at all times. When Vishnu manifested as Krishna, Shesha came along with him as his elder brother, Balarama. One lesser-known legend of the Mahabharata claims that Adishesha was present along with Krishna even during the Great War of Kurukshetra. According to this story, the Divine Serpent supported the wheels of Arjuna's chariot; thereby also protecting the Pandava Prince from harm while on the battlefield. After the end of each of Vishnu's avataras, Shesha returned back to his abode in Patala. Acharya Ramanuja (1017-1137 CE), was a Hindu theologian, philosopher and one of the foremost exponents of the Sri Vaishnavism tradition. Born into a traditional Tamil Brahmin family in the Sriperumbudur village of Tamil Nadu, his philosophical thought lay the foundation for the Bhakti movement. 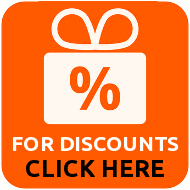 Ramanujacharya is famous as the main exponent of the Vishishtadvaita school of Vedanta. He penned several influential texts, such as a bhashya on the Brahma Sutras and the Bhagavad Gita, in Sanskrit. His disciples too were considered to be the authors of texts such as the Shatyayaniya Upanishad. Considering his great service and contribution to Vaishnavism, Acharya Ramanuja too is considered to be a reincarnation of Adishesha. One of Ramanujacharya's prime followers, Acharya Manavala Mamunigal (1370-1450), went on to become a Sri Vaishnava leader. With the help of his eight disciples, he worked tirelessly to spread Sri Vaishnavism during the 15th century. These disciples later established institutes to teach the Sri Vaishnavite Vishishtadvaita philosophy in Tamil Nadu. Manavala Mamunigal too dedicated his life to the selfless service of Vaishnavism. His only aim was to propagate the Vishishtadvaita philosophy; thus helping people lead a meaningful life, finally attaining moksha (liberation) at the Lotus Feet of Lord Vishnu. While Ramanujacharya had written bhashyas in Sanskrit, the latter wrote the same in Tamil. It is believed that the older Acharya reincarnated as Manavala Mamunigal in order to fulfill his desire to write in Tamil. So intent was he to complete his mission, that he continued to write even when he was unwell and nearing the end of his life. Manavala Mamuni was known by various other names such as Varavaramuni, Sowmyajamatru Muni, Ramyajamatra Muni, Sundarajamatru Muni, Periya Jeer, Yatheendra Pranavar, Vichatavak Shikhamani and so on. His utter devotion toward Vishnu; especially toward the Lord's form as the presiding deity of Srirangam, left an indelible influence on several millions of followers through India and the world over. In view of all of the above points, Manavala Mamunigal is also considered to be an incarnation of Adishesha himself. Once, Vishnu watched Shiva's Tandava or the Cosmic Dance. So rapt did he become in the joyous dance of Nataraja, that he completely harmonized with the Lord of Dance. This created a heavy, pounding sort of vibration, which put an immense strain on Shesha. When the dance of Shiva ceased, Vishnu came back to normal and the weight upon Shesha instantly lifted. Shesha then queried his Lord about the sudden weight and how it had suddenly left him. Vishnu smiled and replied that he had enjoyed Shiva's dance so much that he had harmonized with his great, unending cosmic and Yogic energy. In the meantime, deep in a forest called Daruvanna lived a community of rishis. These rishis had achieved great spiritual knowledge and siddhis, but did not fully realize the true power of Divine Grace. Shiva wanted to enlighten them and requested Vishnu to accompany him on this mission. The latter agreed and the two deities disguised themselves as Bhikshatanas (mendicants) and entered the vast ashrama of the rishis. Spotting Shiva, the wives and daughters of the rishis immediately fell for him and followed him wherever he went. Vishnu then transformed himself as the beauteous Mohini - the Divine Enchantress. As soon as Mohini started dancing, the rishis fell in love with her. They lost all sense of rationality and surrendered their hearts to her. Some rishis were more powerful than the others and soon realized what exactly was happening. They decided to start a yagna (sacrificial fire ritual) to curb Shiva-Bhikshatana. They called forth a tiger from the sacrificial fire. When it tried to attack Shiva, he merely laughed and killed the animal with his bare hands; tearing off its skin and wearing it as a loincloth. Next, the rishis sent poisonous snakes at him. Shiva effortlessly subdued them and draped them around his neck as his ornaments. He then prepared to perform his Tandava. His two other arms appeared, along with a Third Eye on his forehead. This time, the rishis summoned a terrible dwarf, Apasmara. Shiva continued to dance unperturbed. Finally, he stepped onto Apasmara and danced on him as if the dwarf were a mere pedestal for him. Shiva then took the sacrificial fire and held it in his left hand. He also took the mantras that the rishis hurled against him and used them as his anklets and continued to dance unabated. Shiva's Tandava shook the whole world and frightened all the Devas, including his own wife Parvati. They all assembled there, fearing the worst. Shiva, however, merely smiled and showed the rishis his raised left foot. The sages immediately understood their folly and, falling at his feet, completely surrendered to him. In that instant, they understood what Divine Grace was all about and attained realization at the Lord's feet. Having experienced pure joy and salvation from this samsara, they too began dancing joyfully. All of creation joined them and there was happiness and harmony everywhere. Now, Adishesha was intrigued and asked Vishnu if he could learn this dance too. Vishnu blessed him, saying that he would one day attain the grace of Shiva and learn the art from him. He also predicted that Shesha would incarnate as a human being and would shower the entire humanity with peace and wisdom. Much later, humanity was suffering and devotees sincerely prayed to Vishnu, The Divine Preserver, to restore dharma and order on Earth. As the Lord had predicted, it was now time for Adishesha to reincarnate as a human being and give people the knowledge of yoga, to end their suffering. Accordingly, Shesha took the form of Patanjali and descended from the Heavens. The word "Patanjali" consists of the two words "Pata"(to fall) and "Anjali" (mudra or gesture of salutation or prayer). As per Shiva's advice, Patanjali went to a place called Vyaghrapuram to meet rishi Vyaghrapada, an ancient and powerful sage, who was half-human and half-tiger. The former sought his blessings and told him of his desire to watch the Shiva Tandava. In due course of time, Shiva appeared before them and performed his Tandava, thus fulfilling Patanjali's desire. 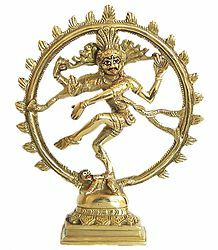 Even today, Patanjali and Vyaghrapada are depicted together, offering homage to Nataraja, the God of Dance. The Sheshnaag Lake is a high altitude oligotrophic lake, which is located at the track leading to the Amarnath cave in the Anantnag District of Jammu and Kashmir. Situated at a height of 3590 meters, it has been recorded to have a maximum length of 1.1 kilometers and a maximum width of 0.7 kilometers. According to Hindu mythology, the lake was dug by Shesha himself - it is believed even today that he stays in this very location. Sheshnaag Lake features many types of fish, among which one can find the brown trout. The lake witnesses heavy snowfall during winter and freezes over, which makes it inaccessible during this season. A popular tourist destination, it is mostly fed by melting snow and streams traveling down from mountain tops. The best time to visit the lake is from June to September. Shesha Sightings - Myth or Reality? A temple called Kukke Subramanya in Karnataka had been in the news some time ago. Visitors to this temple had sighted a five-headed serpent, which they were certain was none other than Shesha manifesting himself. So, is the presence of Adishesha in this temple a myth or reality? There are medical possibilities of snakes having 2 or 3 heads, due to a genetic deformity called polycephaly. However, it is considered to be scientifically and medically impossible for snakes to have 5 or more heads. Besides, the fact remains that there is no official record of anyone actually sighting that type of snake. So, the answer to the above question still remains unclear. While it would seem like an undeniable fact to the believer, science finds no way to support the theory. Irrespective of whether this is myth or reality, the concept of Sheshanaga continues to fascinate believers around the world. 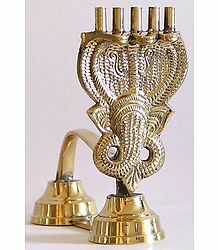 It has inspired several works of art, literature and sculpture in India and abroad. Even today, we can find numerous dance, music, theater, film and other productions in praise of the Ananta Shesha - the Infinite One!